He says he's issuing a "red alert" to the world after a pretty turbulent year. United Nations Secretary-General António Guterres has a message for the world going into 2018: unity. Last year, Guterres appealed for 2017 "to be a year for peace," but says it was basically the opposite. This year he's ramping up his message's urgency factor. "On New Year's Day 2018, I am not issuing an appeal. I am issuing an alert — a red alert for our world," he said in a video message. 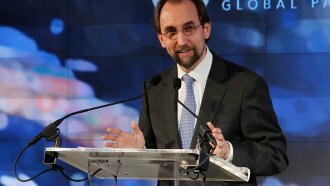 He expressed the need to "settle conflicts, overcome hatred and defend shared values," saying the world's future depends on its people working together. 2017 has been a turbulent year. Guterres cited increased concern over nuclear weapons, climate change impacts, a rise of nationalism and xenophobia, and "horrific" human rights violations. But, ending on a less bleak note, Guterres sent his well wishes, and he did so in a way symbolic of unified efforts. "I wish you peace and health in 2018. Thank you. Shokran. Xie Xie. Merci. Spasiba. Gracias. Obrigado," Guterres said.